How do I subscribe to paid plans? We have a number of plans you can choose from to best suit your needs. For individuals, looking to connect up to 10 social accounts and have full access to our content discovery features and add an unlimited number of feeds, we offer the Individual Plan for $29 per month. For businesses looking to add up to 25 social accounts and collaborate with team members we offer the Small Business Plan for $99 a month. If none of these options are right for you, just contact our support team at support@viraltag.com or our in-app chat to discuss your other options. 1) Click on the 'Subscribe Now' option on the top-right corner of the Viraltag Dashboard. Alternatively, you can also click on the 'Settings' button on the lower left hand corner of the window. 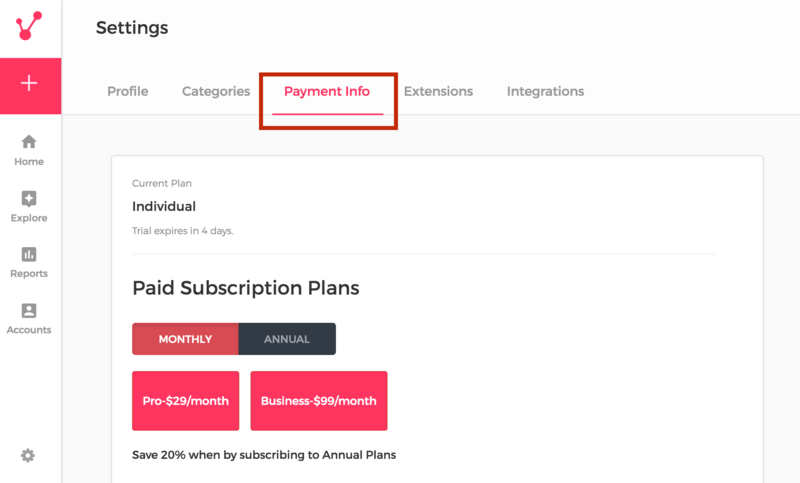 3) Clicking on either button will lead you to a billing window asking you details to process the payment. You will also be able to add a coupon code in case you have one. Once you complete the payment, you will be redirected back to your activated account. If you have any questions related to payment issues, you can contact us at support@viraltag.com or leave us a message in our in-app chat on the Viraltag window.